Fight off Neimoidian forces from occupying the capital of Naboo in a Queen Amidala costume. 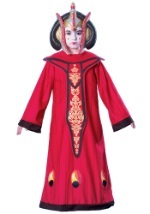 We carry an array of Queen Amidala costumes in toddler, child, and adult sizes as well as regular and deluxe styles to ease the costume selection process. Our Queen Amidala costumes make great Halloween costumes and are perfect for fighting off opposing forces or giving birth to A New Hope.